A great game for friends and family of all ages is croquet, the perfect fun for all ages and great for garden gatherings, bbq’s etc. The Sandford croquet set from Big Game Hunters is a high quality wooden set that I knew all the family would enjoy. Carry bag to carry and store the set. The bag to store the set in is really useful, keeps all the parts together and makes it easy to carry around, although I have to warn you that it is very heavy. This is because all the parts are solid wood, so really are the best quality. I like the way the set is designed for a family with a combination of adult and child mallets and the same with the ball sizes which are again solid wood. Everything is beautifully made so you really are paying for what you get with this set retailing at £99.99. It was then time to try it out which the children were itching to do so we invited the grandparents over for an afternoon of tea, cake and croquet. What I love about this game is that it reaches all ages, young or old, it brings families together. My parents in their late sixties joined in along with my children aged 8 and 5. The children thoroughly enjoyed playing croquet even if we did play to our own rules, but we kept it simple and fun and it was a big hit with everyone. This is definitely a family game and really brings about a bit of competitiveness that everyone can enjoy. The quality of the set comes through when you are playing and it feels good to play with, it’s all very sturdy, looks nice and everything is a good size. We’ve really enjoyed playing this game as a family through three generations and know it’ll be something that will come out on any dry days for a bit of fun and entertainment. Valspar paints from B&Q have a vast range of colours available and I’ve become a huge fan having used the paint in several of the bedrooms in my new house already. It covers beautifully, gives a good finish and is very durable. I was really excited to try out their Garden Colours on an old shed that was left in my new garden to see how it faired. Unfortunately the existing shed had seen better days, but my dad helped to bring it back to life by carrying our several repairs. He replaced a number of the lower slats that were rotten and also completely recovered the roof with new board and felt. Then it was time to try out the paint. I chose Dusky Lilac for the main areas and Moonglow for the accents. First I enlisted the husband to wash down the woodwork before I started to work the makeover magic. So onto the first brushstroke of paint and as you can see below, the coverage is amazing. The paint appears fairly thin but as can be seen the finish is perfect leaving a smooth, even film that dries really quickly as well. The Valspar paint brushes I used look great and were perfect for the job, I used the 2 inch brush for the bulk of the shed and it was perfect, the paint glided off it, there was no shedding of bristles and it looked as good as new at the end. With the paint being so easy to use, I managed to get around the entire shed in just a couple of hours. It really was a dream to use, so easy to cover large areas quickly and with quick drying times it made it easy to manage. I did do a second coat the next day to really help protect the shed and ensure every area was covered but the coverage was instant on the first coat. So with the two Valspar paint coats done, here is the result. Although I was really pleased with the finished result, I wanted to add a few further touches to make it look a bit more special and quaint. First I got my dad to add a few strips of scrap wood to the edge of the windows to frame them and give me somewhere else to add my accent colour. I then also found an old, unused picture frame in my attic which I removed the glass and backing plate from and then painted it up in my garden colours. And this is the finished result that I was aiming for. I’m really pleased with the result and I think it looks great in my garden. I love looking at the before and after pictures to remind me of how good my revamped shed looks. It was a much easier paint project to do than I expected, the Valspar garden paint was so easy to work with, I’d highly recommend it to anyone and am looking forward to finding something else to paint for my garden now I know what a pleasure it is to use. Being a water based paint the brushes are easily washed in water. The brushes I used, you’d never know they’d been used to paint a shed and I can’t wait to continue using them around the rest of my house. My garden shed is now a pleasure to see at the end of my garden. We’ve also added some shelves and storage boxes inside and it has become a garden toy store and a place to keep gardening equipment. I’m hoping we’ve extended the life of shed by a good few years with a combination of the replacement wood, new roof and fantastic new Valspar garden paint colour. Gardens2you is a garden ornament and accessory online store, brimming with beautiful items to decorate your garden. From pretty planters to lighting, bird care to decorative pieces there really is something for everyone and lots to make your garden look fun and interesting. 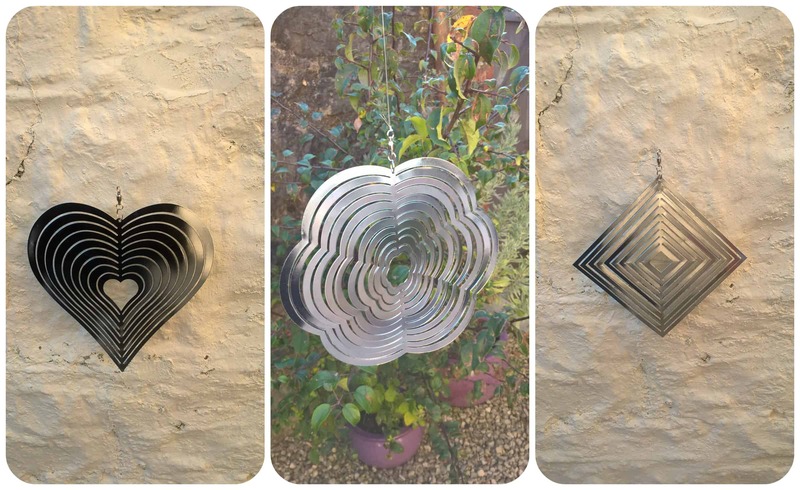 This pack of three steel wind spinners are really attractive. I love the shiny silver that adds reflection in the garden. 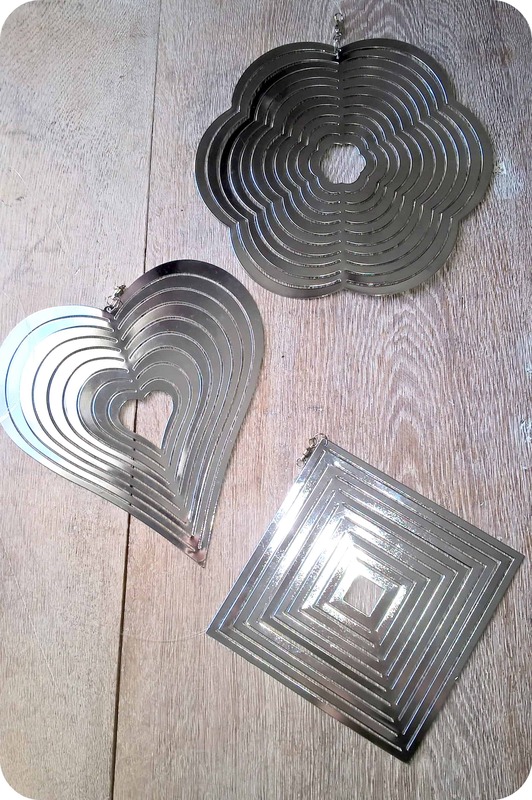 The pack contains a diamond, heart and flower shaped spinner all approximately 20cm across. The spinners have a long thread with a ring at the top to simply hang over a hook or branch of your choosing. The spinners sections can be easily bent round to make them 3D and help them spin round in the wind. I think they look really pretty in the garden particularly on a sunny day when the light is captured on them. They are frost and weather resistant, although I think I’d keep them inside during the wettest months and hang them out again in the Spring. A lovely addition to brighten up any garden! 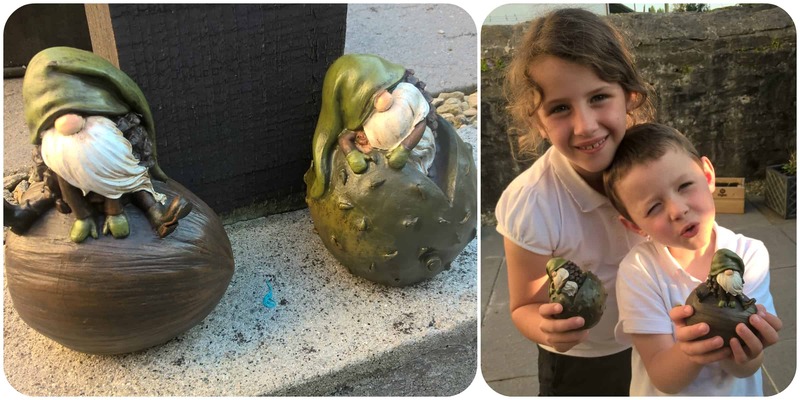 I wouldn’t say I’m normally a fan of garden gnomes, but this cute little pair have brought me round and sit proudly in different places in the garden. The children have taken to them rather fondly and have chosen one each which they have positioned in the garden. “Pike and Pine” are a nature inspired set of mini gnomes perched upon things they’ve found in the garden. Approximately 12.5cm tall and made from weatherproof resin, this are great for a fun feature, or little objects to hide around your garden. Being green and brown they blend well into the outdoors and look quite at home. We love these little fellas who’ve made our garden their home and keep the children occupied moving them about and trying to find them again. 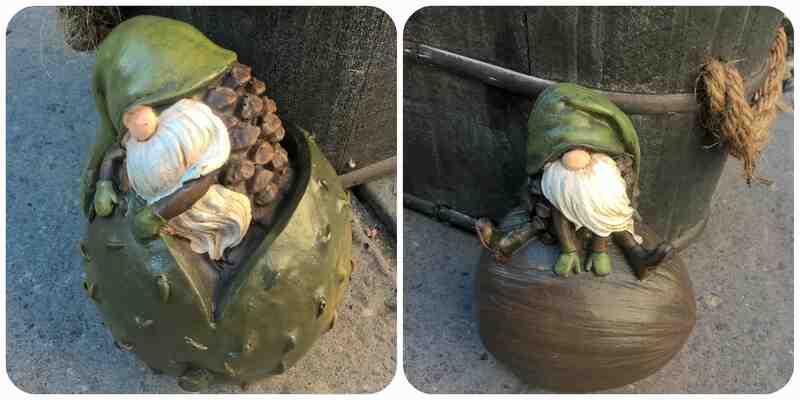 There are many other pairs of gnomes like these available so you should pop over to Gardens2you to check them out. All reviews are my own and my family’s opinions and we received the ornaments in order to write the review. 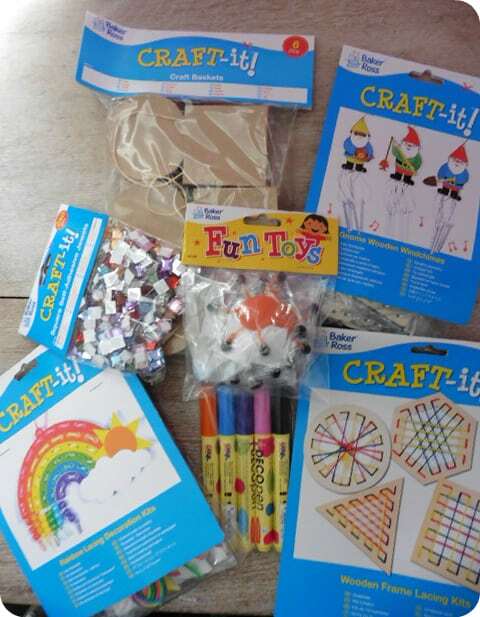 Baker Ross has a fabulous range of home craft kits and the box of summer crafts we received from them certainly didn’t disappoint. My two children love arts and crafts and couldn’t wait to get started! We started with the Rainbow Lacing kits which they did when a couple of friends came over. 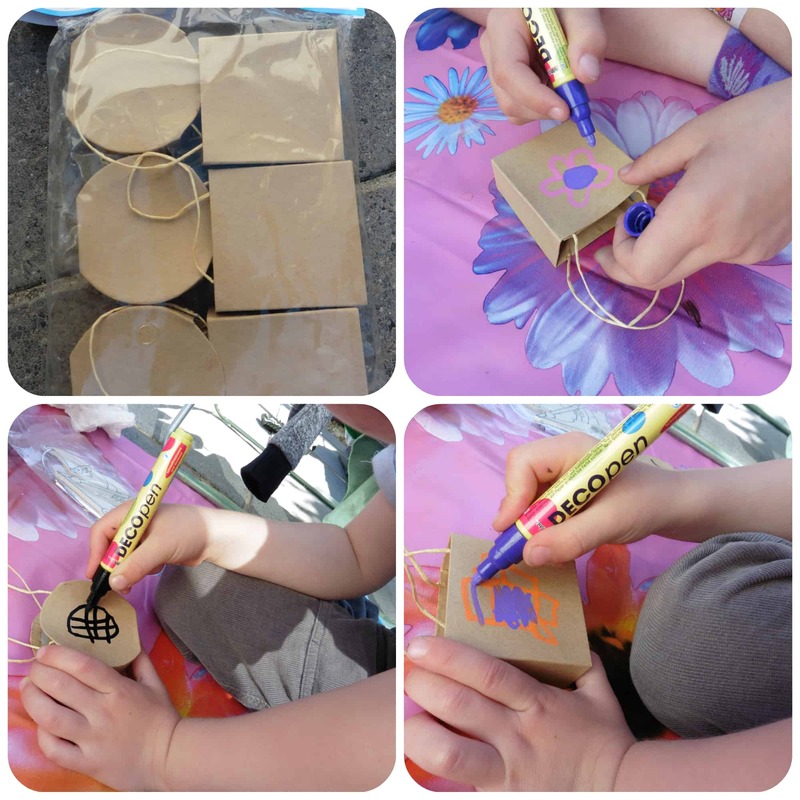 All the children were totally engrossed and loved this craft. Firstly they had great fun using a pencil to punch out the centres of the pre cut holes in which the laces go. 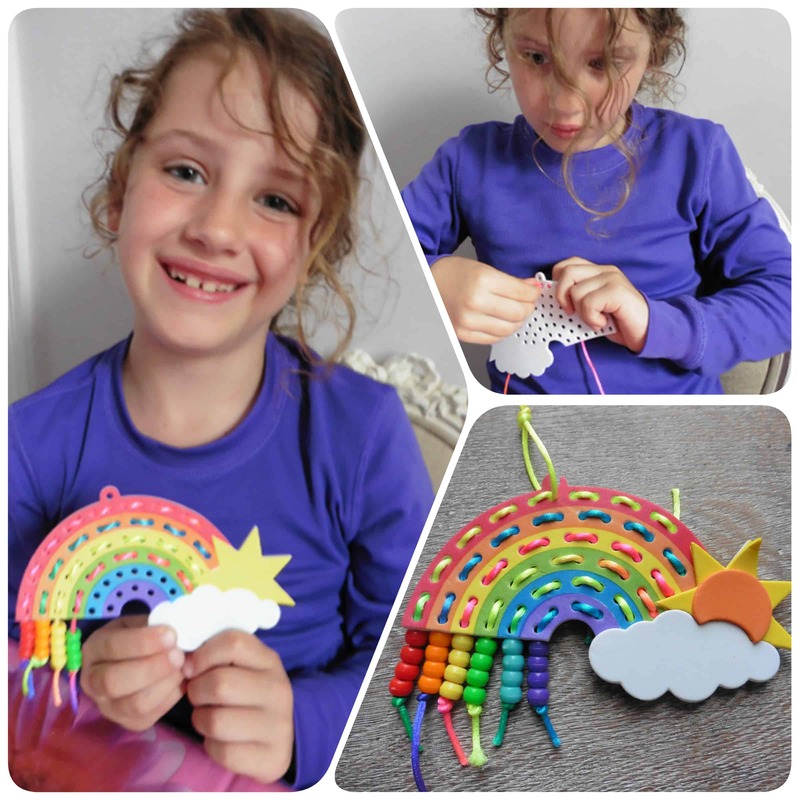 Then they laced around the rainbow adding beads at the end before sticking cloud and sun stickers to give it a 3d effect. 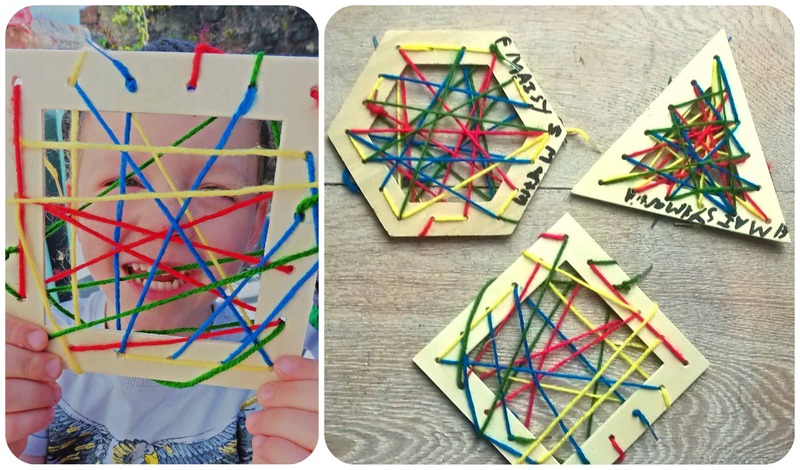 Another lacing craft we did was the Wooden Frame Lacing which I wasn’t sure how keen they would be but both of them were so enthusiastic and wanted to do these, it surprised me. They sat eagerly in the garden totally engrossing themselves in picking coloured strands of wool and threading them across the frame. And here are their finished results! 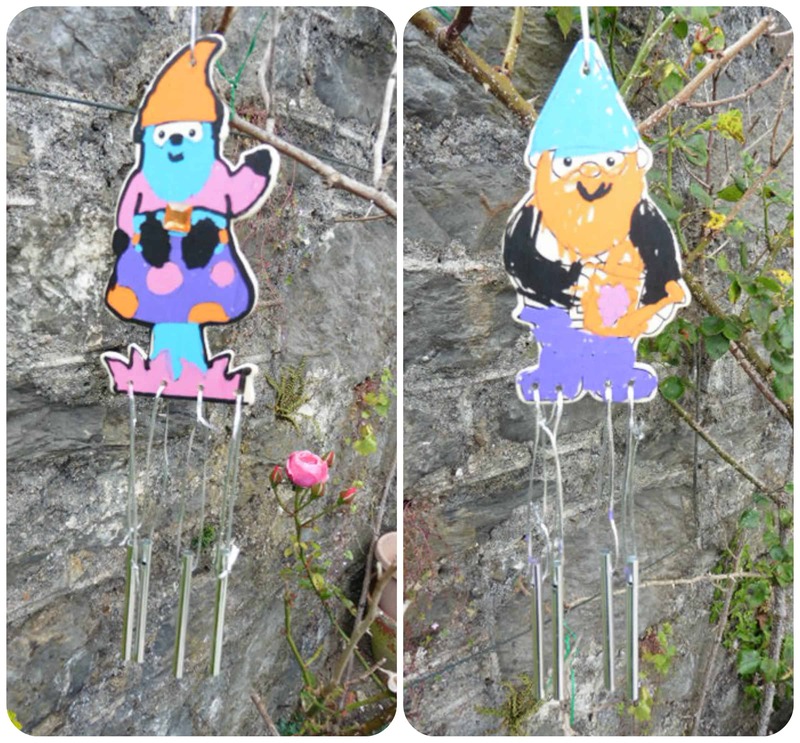 The Garden Gnome Wind Chimes caused a lot of excitement over who was going to colour which design. We also received some acrylic decoration pens which I was very impressed with. They were so easy to use and left really vibrant colours on the wood as we coloured without any mess. I loved the children’s creations and couldn’t wait to hang them in the garden. Finally we set to work on this cute little craft baskets which the Deco pens worked perfectly on. We also had some stick on gems, which had a simple peel off back to add some glitz to the baskets. 4yr old Mister B did his own designs, while 7yr old Miss M decorated some baskets especially for Nanny as it’s her birthday coming up and we are going to get some chocolates to put inside and use as a gift bag. 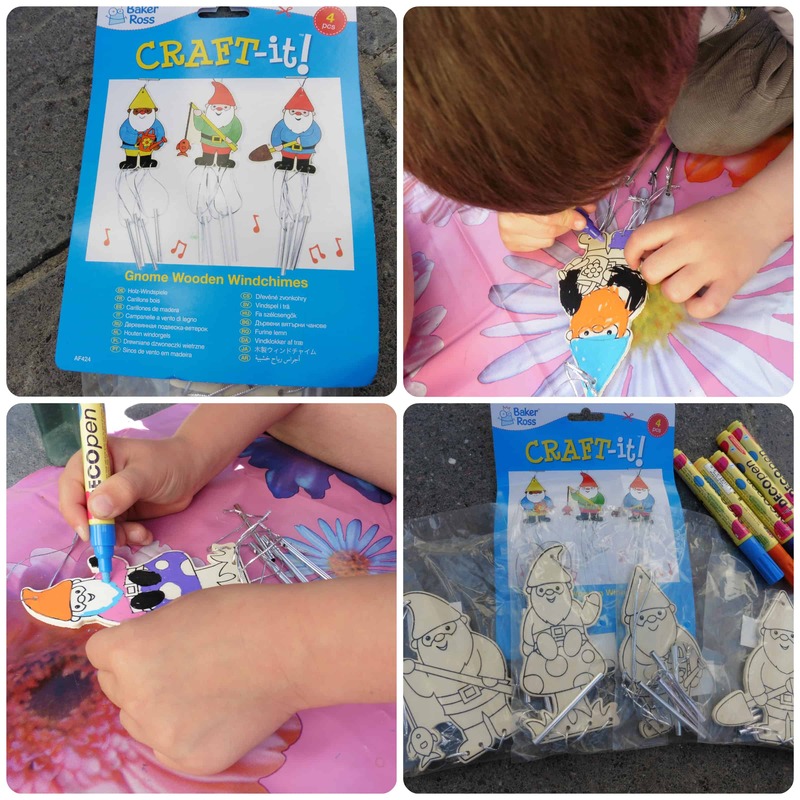 My children have absolutely loved the Baker Ross craft kits and have sat down over many days trying out different ones. These are all perfect to occupy little ones over the summer holidays and are simple to do, but effective when completed. When the sun starts shining and the warmer weather appears, it’s great to get out in the garden and spruce it up after the winter months. I only have a small courtyard garden but like to make the most of it, after all, it gets the sun and the kids love eating out there in the summer months. Home Bargains have a vast range of bits and pieces for the garden from decorative items, things to grow and more useful, practical items. We received a selection to try out and coudn’t wait for a dry day to get outside. The green, stacking chair cover (£1.99) was perfect for me. We have a stack of four chairs that live permanently outside and look a little more weathered each year. I also get fed up of having to wipe them down everytime we go outside. 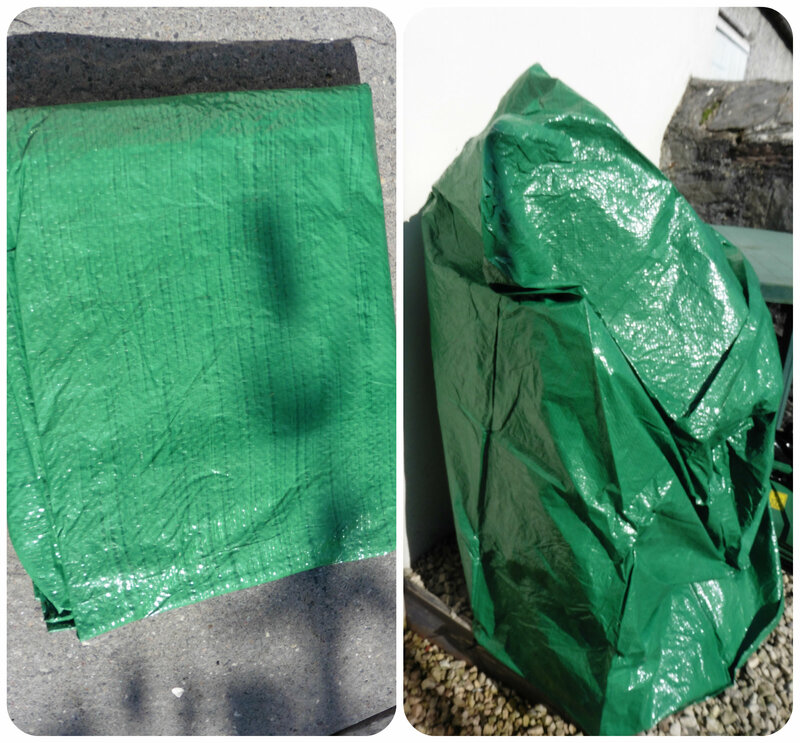 This cover fitted perfectly over them and keeps them nice and protected from the elements in this strong cover. 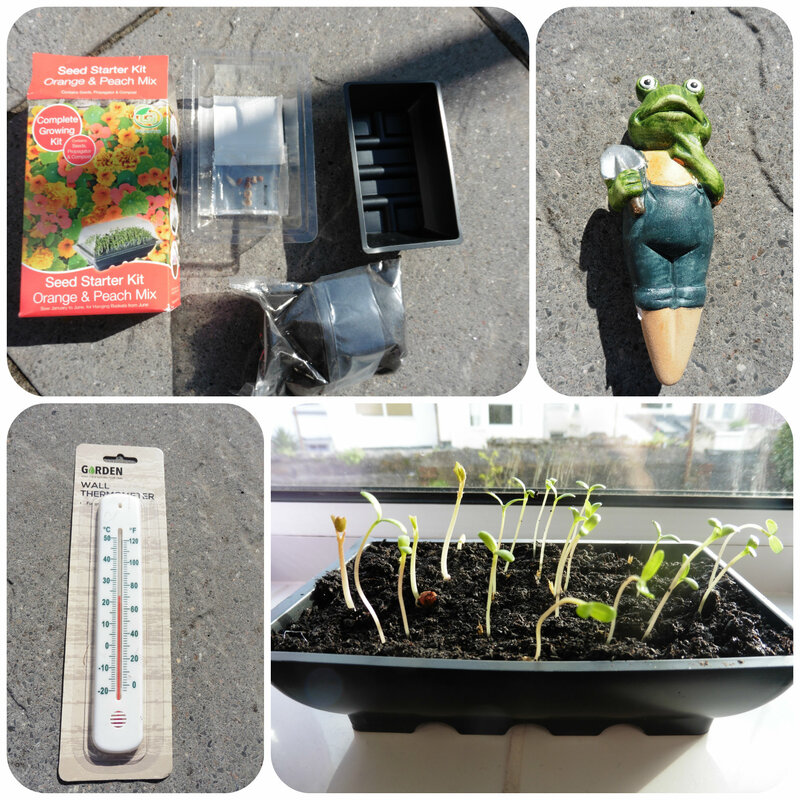 My children love helping me to plant seeds so the Seed Starter Kit in Orange & Peach was set up straight away and within a few days we had little seedlings. We also had a basket liner (99p) which we will use when our seeds get a little bigger to hopefully create some hanging basket displays. We are looking forward to a lovely display of Marigold and Nasturtium flowers over the summer. The children decided to put the Frog ornament (49p) in their tray of sunflower seeds that they are growing. They also couldn’t wait to have a dig with the yellow fork (89p) and even wore the green gloves (49p) to help plant some seeds from the 6 in 1 seed pack (79p) in seed trays. Fingers crossed we may get a crop of vegetables later in the year and the garden netting will prove useful in protecting them from nasty pests (99p). The thermometer (69p) is great to hang on a wall outside, or in a greenhouse so you no how hot (or not) it is. 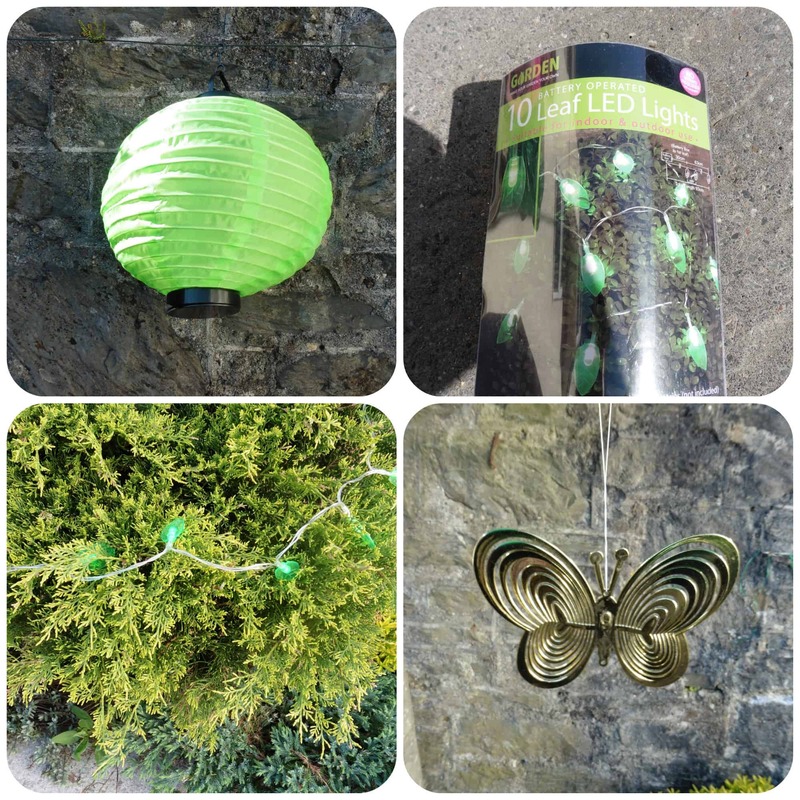 For a bit of outdoor decor, this green solar lantern (£1.99) can easily be hung up anywhere, and the pretty green leaf fairy lights (£1.59) look great draped across a tree in the early evening. Also this gold coloured butterfly (79p) makes a pretty addition hanging down from a small tree that we have and twirls around in the breeze. 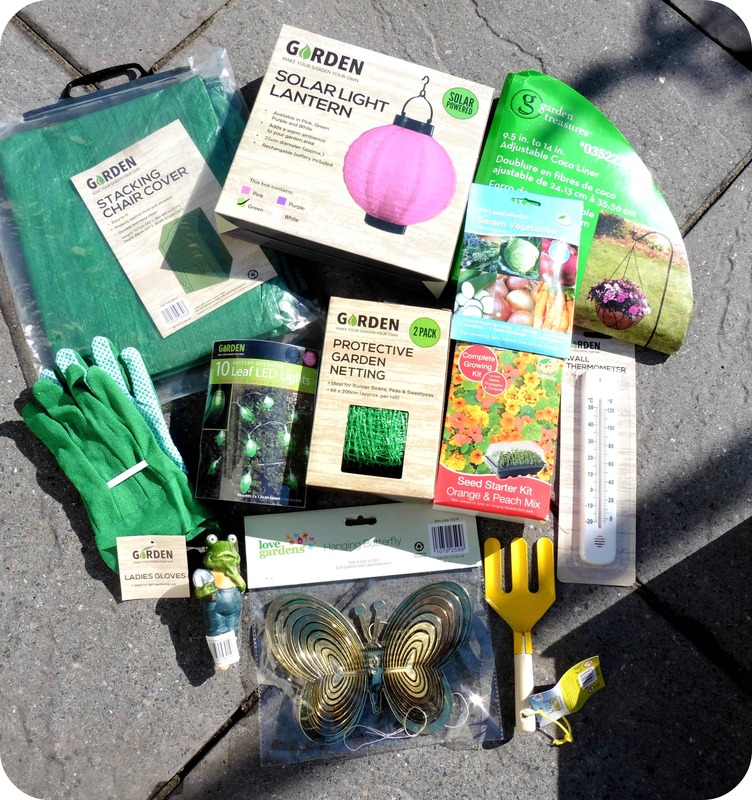 Our garden has certainly been brightened up and tidied up with these useful gardening bits from Home Bargains and at some amazing prices!! Why not check out Home Bargains and see how you can improve your garden? All reviews are my own opinions and I received the products in order to write the review. 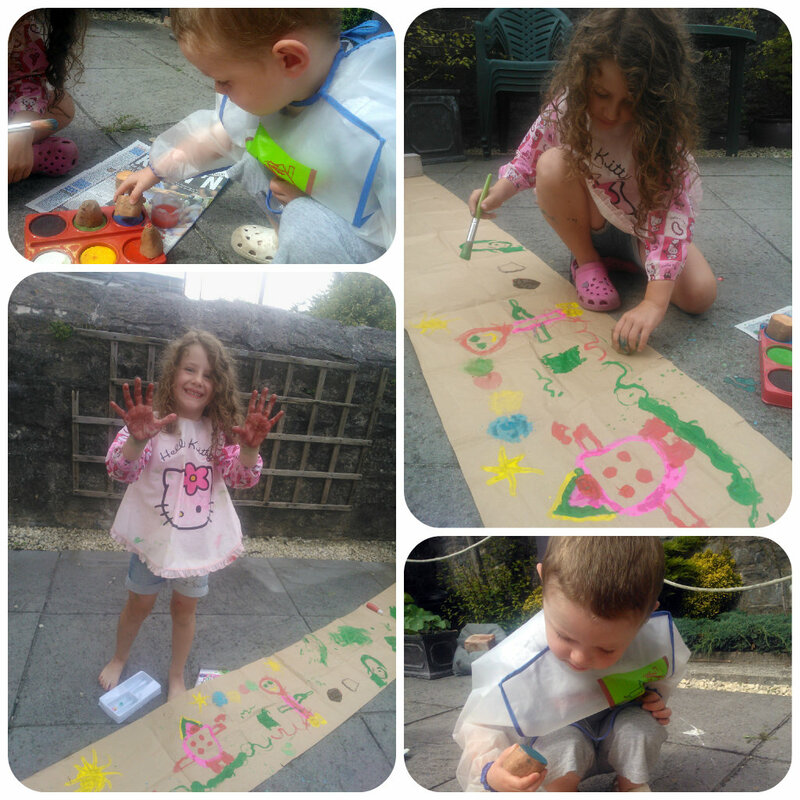 I’m never keen on messy play, so summer is the ideal time of year for me to get the children outside and let them be creative with paint. A few days ago, I took a long strip of paper (some packaging paper that had come with a parcel I was sent) and laid it across the patio. We had some 99p sponge paints from the 99p shop, along with some solid paints, brushes and some cut up potatoes. 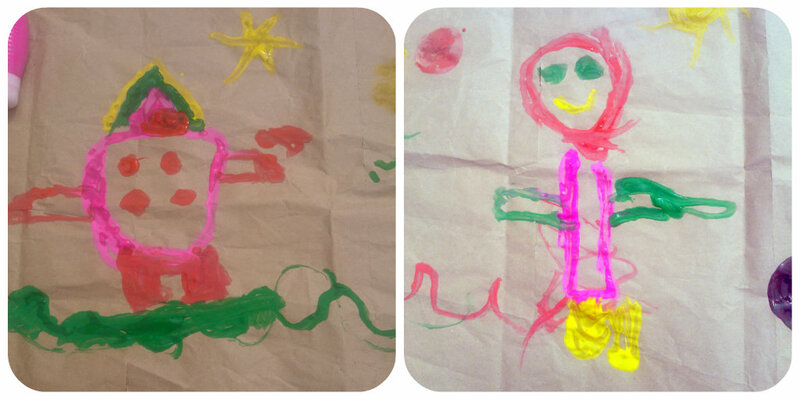 My two couldn’t wait to get stuck in decorating the piece of paper anyway they chose. They even decided to paint their hands to make prints. My children had so much fun free painting as they wished using the materials they were given. 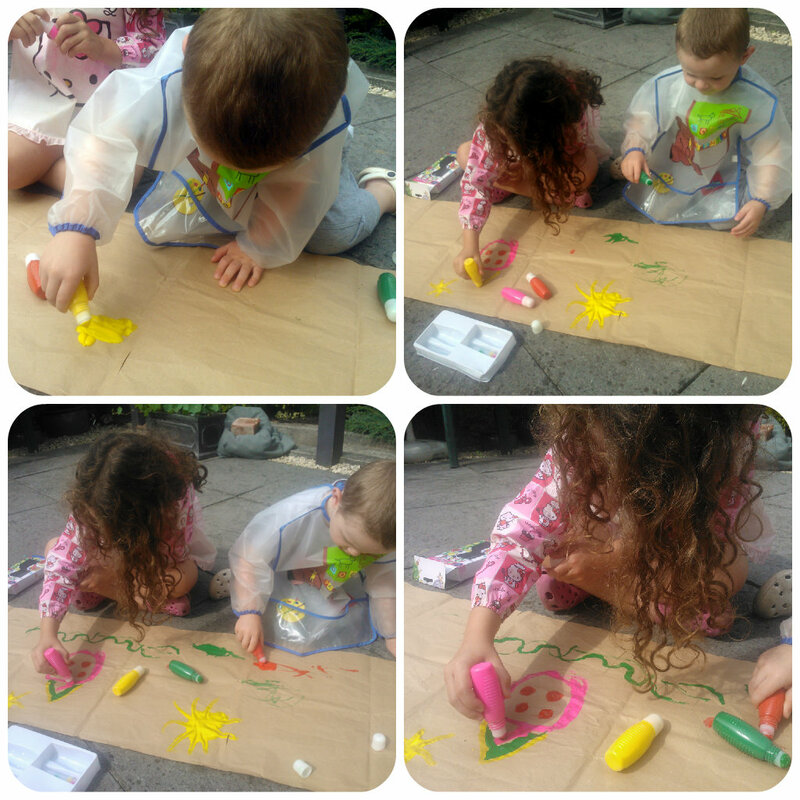 They were kept entertained for a couple of hours and loved every minute of being outside with paints, using their imagination to create their artistic masterpiece! So simple, yet so much fun can be had being outside on a sunny day, keeping the mess out of the house. 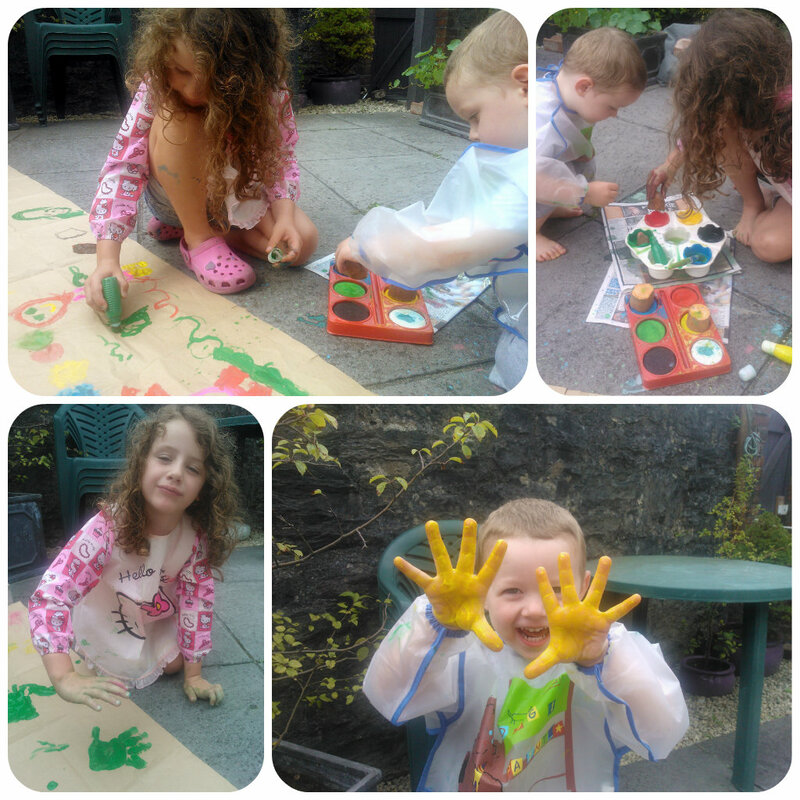 We had great fun – why don’t you try outdoor painting too? 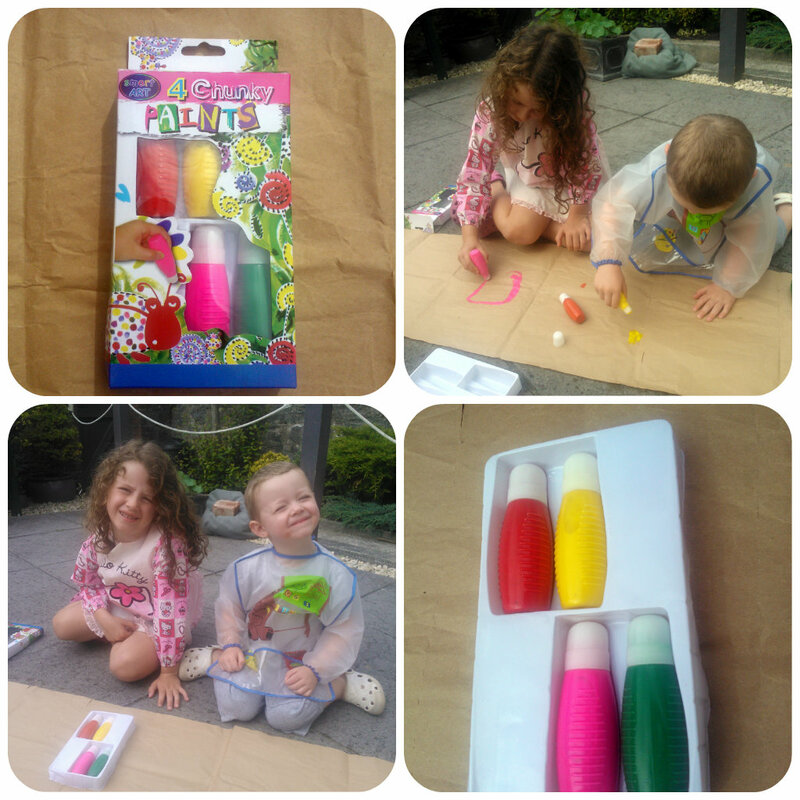 During the summer we were asked to review Crayola Washable 3D Outdoor Chalks for izziwizzikids. The 3D Outdoor Chalk allows you to create eye-popping 3D effects with the dual coloured 3D outdoor chalk and 3D glasses. They are simple to use, give you amazing results and the special chalk combines the right colours to make the magic happen! To get your creative juices flowing, there’s a “How To” leaflet included which shows you how to start with simple shapes, eventually building up to using the 3D effects. When I first showed these to Miss M and told her she could draw in the garden her eyes lit up and she couldn’t wait to get started. At first we followed the simple instructions to create a basic drawing which allowed us to sample the 3D effects successfully. We then had to wear the 3D glasses to view the effect which proved a great hit with Miss M. I was impressed with the 3D results as the drawing really did seem to lift from the ground with the different colours appearing at different levels. Miss M loved this activity and the chalks were continued to be used day after day to turn the entire patio area of the garden into a myriad of colour. This was a thoroughly fun activity that could be done again and again. 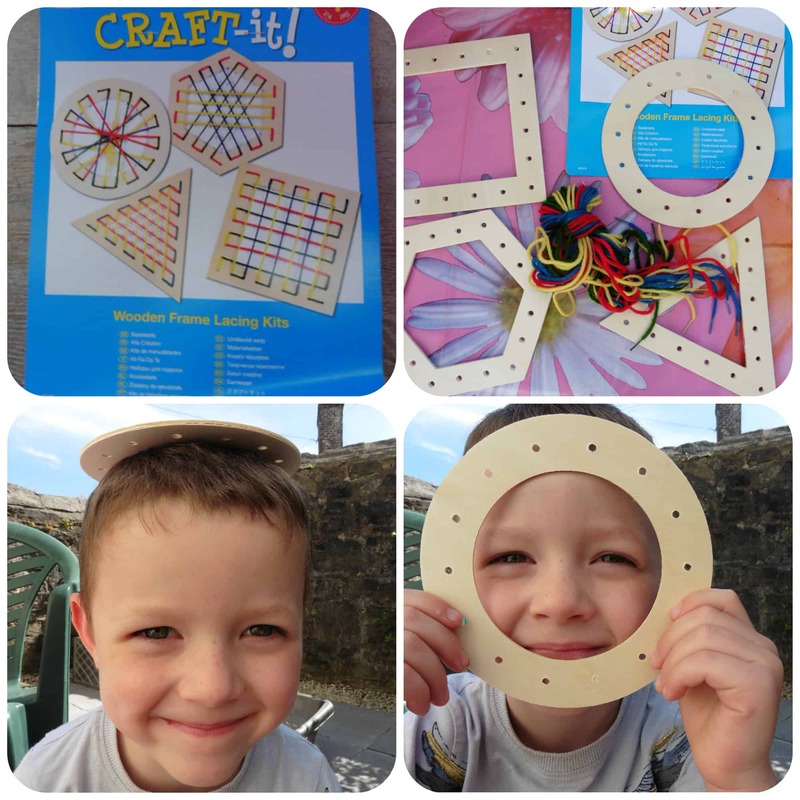 We loved it and would definitely recommend it for children as a fun summer outdoor activity that encourages creativity, has a fun novelty factor with the 3D effect and keeps them occupied for a good length of time.